At this moment, Spc. 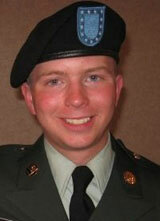 Bradley Manning is alone in solitary confinement in a tiny cell at the Quantico Marine Base in Virginia, where he has been in isolation for over 9 months. As the New York Times wrote in its editorial this week: "For one hour a day, he is allowed to walk around a room in shackles. He is forced to remove his clothes every night. And every morning he is required to stand outside his cell, naked, until he passes inspection and is given his clothes back." Bradley Manning, if he is responsible for what he’s been charged with, is being subjected to outrageous abuse by the U.S. government because he told the truth. The wars in Afghanistan and Iraq, and U.S. foreign policy as a whole, are based on nothing but lies and deception. All we get from the White House and the Pentagon are lies. Every day, people die because of those lies. On March 19, thousands of people across the country will be telling the truth, too, by taking to the streets in protest against the wars. In Washington, D.C., there will be an massive veterans-led civil resistance at the White House initiated by Veterans for Peace. People from all over the country are joining together for a 12 noon rally at Lafayette Park, followed by a march on the White House where the veterans-led civil resistance will take place. You can help a veteran come to Washington, D.C., to stand against war and occupation by making a donation toward travel expenses. Many people coming to Washington, D.C., will be also participating in the Sunday, March 20 demonstration at the Quantico Marine Base in Virginia for the largest-yet rally in support of Bradley Manning, organized by the Washington Metro Chapter of the Bradley Manning Support Network and endorsed by many organizations. The demonstration begins at 2 p.m. on Main Street and Rt. 1 (Jeff David Hwy.). Demonstrations will be taking place in cities and towns across the country. Click here for details. The most powerful voices telling the truth will be coming from the Iraq and Afghanistan veterans, who have since dedicated themselves to building the anti-war movement. Your donation will help make their voices heard. Many are able to travel to Washington, D.C., to participate in these two actions because of the generous donations from supporters like you. But many more want to come and take a stand—with your support, we can make the strongest possible statement on March 19 and March 20: those who have fought these wars will fight to make them end, will fight for the freedom of Bradley Manning, and will fight for justice here at home. My last day in the U.S. Army was on Dec. 18. On Dec. 16, I participated in my first anti-war action. I was on leave from the Army and could not afford to travel to the demonstration on Washington, D.C. The only way I was able to make it to the Dec. 16 action was by the help of sympathetic, compassionate people who understood how important it was for vets that not only oppose the war but want to get involved. Right now, you can help a new generation of veterans like myself become a part of this movement. After deploying to Iraq for a combined total of 28 months, countless raids, assaults, patrols and endlessly harassing the people of Iraq, I began to second-guess my government’s motives. I, like most soldiers, believed in what we were doing but the reality of the occupation destroyed every thread that wove that lie together. Dec. 16 and all anti-war demonstrations are important to vets who understand their new-found role once they opposes the occupations. The "elected" government officials of Iraq and Afghanistan do not represent the interests of the peoples of these occupied countries; they dance to the demands of Washington. Veterans have a special voice and specific moral and ethical obligation to the people of these destroyed, brutalized and occupied countries to stand in support of the occupied peoples. It is sometimes hard for vets who are discharged either medically or by other means to attend these demonstrations to show solidarity. There is no way I would have been able to show support and participate without the help of two strangers that honestly do believe we need to stop these wars. To those who made it possible for me to travel to stand against the wars, I thank you. I am writing this appeal to ask everyone to help other veterans participate and become anti-war activists. We can all make a difference and we are all in this together.